Mario Kart's second DLC pack has released finally and with it come eight awesome courses. I wanted to gauge the interest and appreciation of these various courses around here so I thought I would put on an Eviction Poll to determine the proper order of things. For more discussion on Mario Kart 8, visit it's Discussion Thread. This phase of the Eviction Poll is live until Friday, May 8th, @ 10:59 PM EST. Super Bell Subway is a level that had people mixed. We saw the largest spread of votes so far and even when folks chose it they still expressed their appreciation for it. Full of fun nods to Super Mario Bros. and another train/traffic-based track-hazard, this track's time was up. Now four remain. For my symmetry-loving brain, I'm happy to see two from each cup left. Perhaps this Mario Kart DLC is rather awesome all around eh? Will the Wild Woods burn down? Will Animal Crossing go into foreclosure? Will the Ribbon Road fall apart? Or will Big Blue be nothing but a big F ZERO! Crossing Cup - Animal Crossing for sure. The other three are great tracks. Again, Crossing Cup - Animal Crossing gets my vote despite it being a very enjoyable track. Big Blue. It's definitely an exciting track, but I actually prefer Animal Crossing's shifting seasons and leasurely driving. Same. Big Blue gets my vote this time. I liked that it's was the only new 'straight' race situation but those have their downfalls too. It seemed a bit familiar with the rushing waterways and besides a lot of coin opportunity, it doesn't do too much for me. I highly prefer Animal Crossing's great personality and lap'd style. 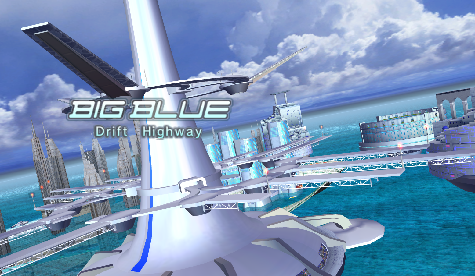 Speaking of Big Blue, I think the Mario Kart 8 track reminds me more of FAST Racing League's first couple of stages from the Shima League, than it does of an actual Big Blue track. There's an abundance of cliffs, trees and buildings in the background, and it almost feels like there's more water on the track than surrounding it. The GX version has a ton of buildings, but it's still located on a vast ocean. It is finally your time, Animal Crossing. I like the theme a lot, but it doesn't quite hold up to the other three as a racetrack. Animal Crossing. The different seasons thing is nice, but the track is a little bland as a whole. I wish it wasn't being voted so often but.. while I like it, I would have done something differently. Made it more dynamic like you're racing through an actual person's town. I think a randomly generated town might have helped...the seasons thing is a nice touch, but you only get one of four outcomes every time you race on the track. I like the track, but of the four remaining, it's my least favorite. Aw man, Wild Woods might win now. Oh well. Two votes for Ribbon Road but no official votes in the thread. Why why why? Probably because they're embarrassed for voting away one of the most fun tracks in the game. Perhaps... but what's your vote then eh? @NoName You're right, I was surprised to see the subway track gone already. So fun! Voted Ribbon Road, but honestly all the remaining ones I like a LOT. At this point voting is pointless, as my favorite track (from the list) is getting the boot. But your opinion matters to me! Don't pout! Vout! I mean, Vote!